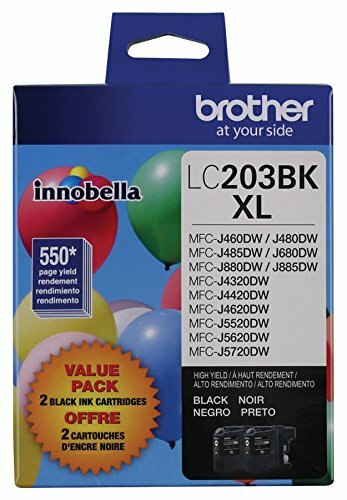 Brother Genuine replacement high yield ink cartridges like the LC2032PKS produces sharp, black pages with the quality you expect from Brother products. The Brother LC2032PKS replacement ink cartridges are is compatible with 12 Brother Inkjet printers. These professional cartridges are intelligently engineered to work in seamless unison with your Brother printer. This product is sold as a two-pack of individual black ink cartridges. The Brother Genuine LC-2032PKS replacement high yield black ink cartridges can print approximately 550 pages/cartidgein accordance with ISO/IEC 24711 (Letter/A4) standards. Brother is dedicated to being environmentally responsible and offers disposal programs for properly discarding its cartridges. These replacement cartridge are compatible with the following Brother printers; MFCJ480DW, MFCJ485DW, MFCJ680DW, MFCJ880DW, MFCJ885DW, MFCJ4320DW, MFCJ4420DW, MFCJ460DW, MFCJ4620DW, MFCJ5520DW, MFCJ5620DW, MFCJ5720DW. BROTHER GENUINE CARTRIDGE - LC-2032PKS is a Brother Genuine two pack of black ink cartridges that produces exceptionally high quality prints. YIELDS UP TO 550 PAGES/CARTRIDGE - These replacement high-yield black ink cartridges yield approximately 550 pages/cartridge in accordance with ISO/IEC 24711 (Letter/A4) standards. SEAMLESS INTEGRATION - These professional replacement black ink cartridges create deep black prints, engineered to work in seamless unison with your Brother inkjet printer.